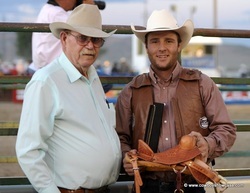 Brock Winn of Ferron, Utah, received the coveted Bill Maupin miniature “association” trophy saddle at July 2011's Silver State Stampede. Brock is the 14th recipient of an exquisitely made little saddle. Maupin has been creating small replicas of full sized bronc saddles since 1998 to be awarded to the Stampede Saddle Bronc Champion. Each saddle is just a little different than the one before, but they all have trees made by Timberline Saddle Tree Company in Vernal, Utah. There is one more miniature tree in Maupin's shop, so there will be at least one more trophy for next year's Stampede, he says. 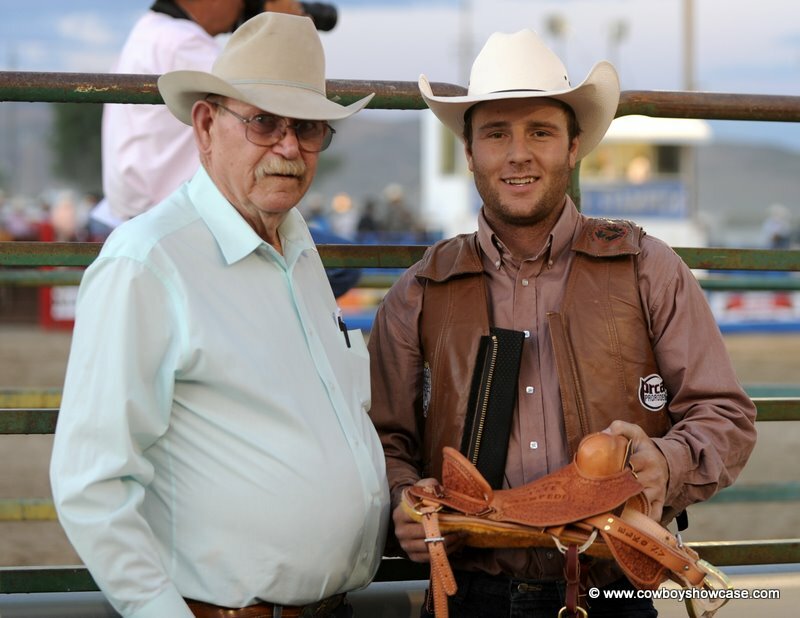 Maupin donated his first little saddle to be auctioned at the Nevada High School Rodeo Finals in Fallon to benefit a badly injured high school rodeo saddle bronc rider. Other than the mini bronc saddles, Maupin has made some small stock saddles. 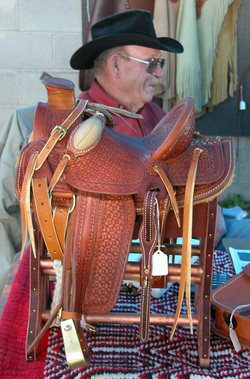 One is owned by Tana Gallagher of Lamoille who bought it directly from the saddlemaker. He made another one for a high school rodeo coach who lives in Montana and he donated one more to another high school benefit auction. Maupin, himself, rode saddle broncs in his youth in Wyoming, so he knows what characteristics make a good competition saddle; and he notes that Charlie Gardner, a Nevada champion bronc rider who lives in Ruby Valley, is the designer of the saddles Maupin builds today. 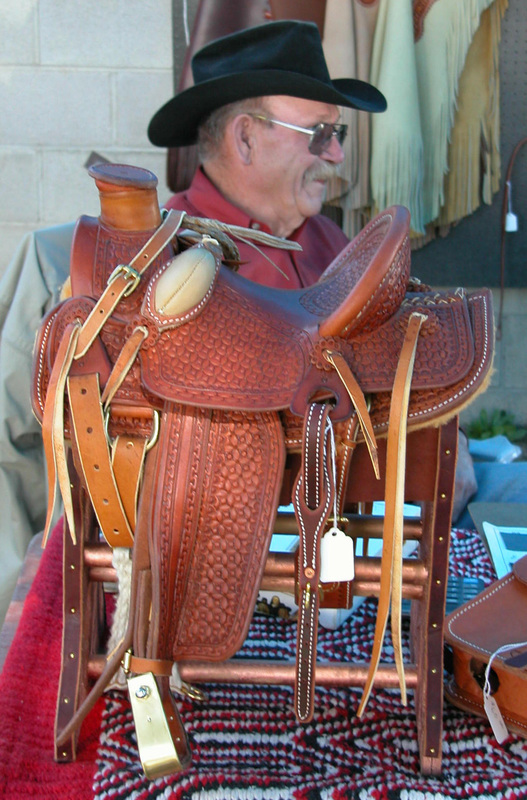 He says he makes 14 to 15 full-size saddles annually for professional cowboys in many Western states: Utah, New Mexico, Arizona, Idaho, California, Wyoming, Montana and Nevada. Occasionally he builds a working saddle for one of his bronc riding customers, but he does not do other kinds of leather work for the public. He started making saddles after he returned from the Korean War where his job was to patrol the front lines at night with his German Shepherd, Arlo. He was discharged in 1952 and resumed competing in rodeos and punching cattle until 1964 when he bought a saddle shop in Dillon, MT. Soon after, he hired on as a feed lot rider for the MC Ranch in Adel, OR. From then on, he expanded his career in the livestock industry and did not return to saddle making full time for decades. He managed a number of large ranches throughout the west including, lastly, the IL in Independence Valley. When he and his late wife, Wanda, retired from that job in 1993, he restarted a saddle shop in back of his Spring Creek home where his border collie, Snert, greets customers. Bill and Wanda's daughter, Brandy, is a human acupuncturist in Murraysville, PA. Maupin also works as brand inspector for the Nevada Department of Agriculture. The winners of Bill Maupin miniatures are: Troy Cattour, John Hammick, Pete Aritola, David Howard, Ira Slagowski, Ira Wines, John Wright, Jess Jones, Stormy Sagers, Devon Sagers, Wyatt Smith, Jake Larsen, Jesse Wright and Brock Wynn. Bill passed away in the summer of 2013.